We’ll start out with probably the most obvious of must-eat foods in Spain: Paella. Paella and Spain go hand-in-hand like peanut butter and jelly or airplanes and lack of legroom. While travelers think paella is synonymous with all of Spain, it’s actually from the autonomous community of Valencia. 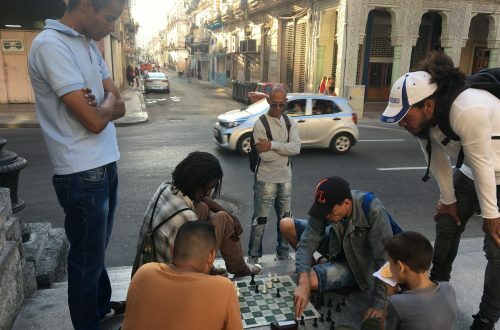 In saying that, we realize that not everyone will be visiting Valencia during their time in Spain. The good news for you is that you can get paella all over Spain. We’ve eaten it at a few different places in different cities. Our favorite place for paella in Spain so far has been Casa de Valencia in Madrid. You’ll get a ton of paella for a reasonable price at a really nice restaurant! 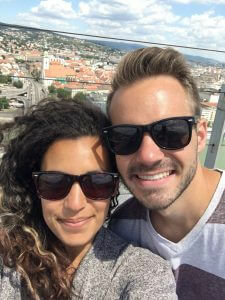 Check out Our Recommendations for a Trip to Madrid post for more advice on where to eat in Madrid. Just looking at plates of jamón makes us start to drool… Spain is famous for its cured ham. 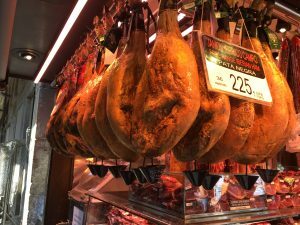 You’ll see legs of jamón hanging in most bars throughout the country, a tradition that supposedly started back in the days of the Spanish Inquisition. Back then, Jewish bar owners would hang the jamón legs in order to avoid questions from Christians about their religion because under Judaism, they cannot eat pork. There are two types of jamón in Spain: jamón ibérico and jamón serrano. 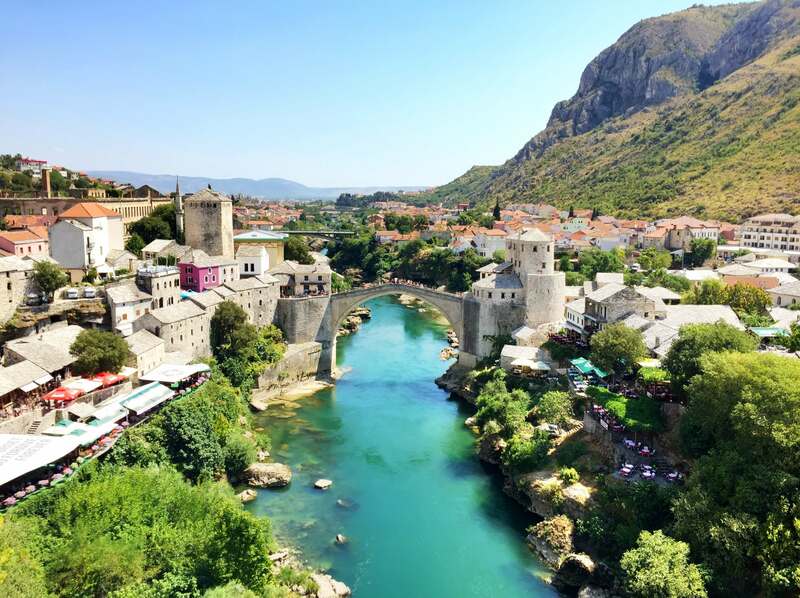 While the difference may not be noticeable to the average traveler, there is a difference. In short, Jamón ibérico is more expensive and is made from black-hoofed pigs that are fed a diet that primarily consists of acorns. The ibérico is cured for at least 24 months. The cheaper, jamón serrano is made from white pigs and cured up to 15 months. 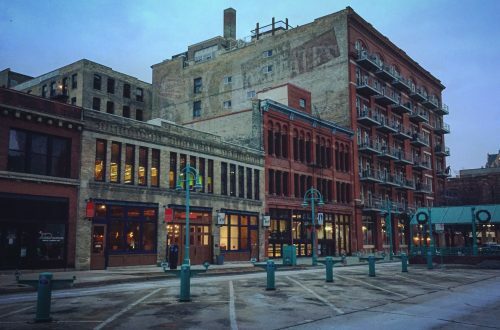 For more of the differences between the two, check out this article. 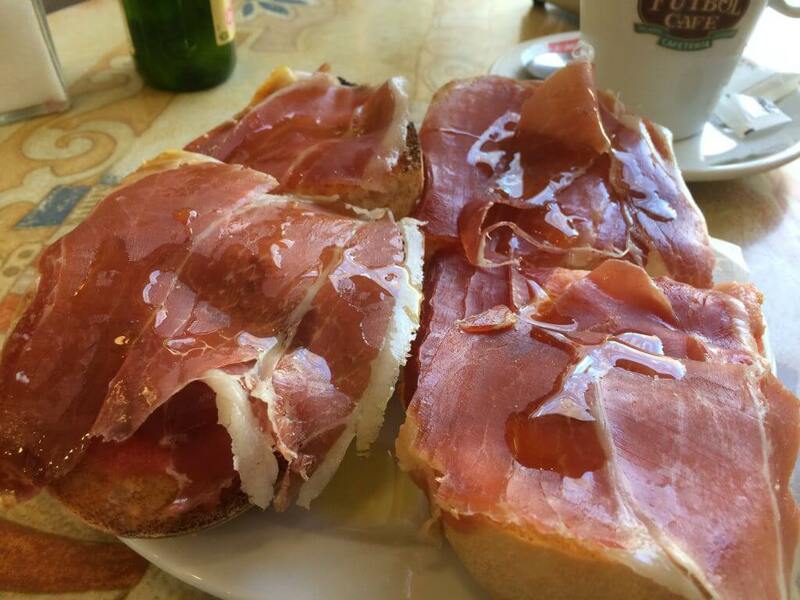 Both types of jamón are must-eats in Spain! If you’re vegetarian and visiting Spain, jamón obviously won’t be your choice. However, don’t fret. Wherever there’s a charcuterie board of meat, they’ll most likely have a cheese board too. Spain has tons of delicious varieties of cheese with its most popular being queso manchego, or Manchego cheese. Chances are while you’ve had this back home on a cheese board or some new-age hipster mash-up burger, it’s better in Spain. It’s cheaper and fresher. 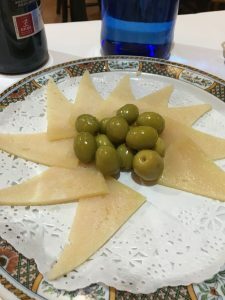 The beautiful thing about this must-eat food in Spain is that you could also pair it with a jamón plate as a snack, appetizer, or even a meal. We were clearly hungry and ate a piece before snapping this pic. A Spanish mainstay, tortilla española also known as tortilla de patata, is made from egg and potato. Many people think it’s rather bland, but we think it’s delicious. You can order it con picante too if you want a little spice. 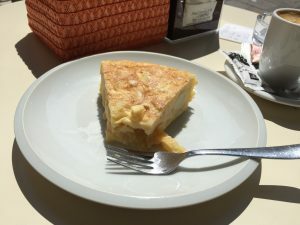 While the traditional tortilla española is just eggs, potato, and possibly onion—with or without onion is a huge debate within Spain, think Barcelona or Madrid—you can also find it with a number of other things in it. 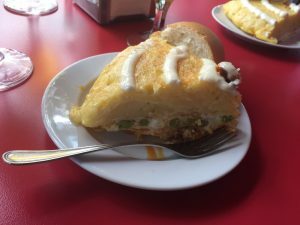 Eat tortilla española as a tapa with a caña at a bar for a nice afternoon snack. We already included jamón on our must-eat foods in Spain list, but here’s another must-eat meat in Spain for you: Chorizo. Spain has a knack for producing quality meat. The chorizo in Spain is not the same as Mexican chorizo, so don’t expect to get the same thing. 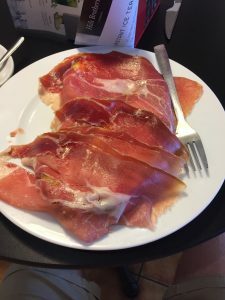 While you can order it by itself, you might also get it on an embutido (plate of various cured meats) with some of the above mentioned jamón. The Chorizo is in the middle of this embutido. 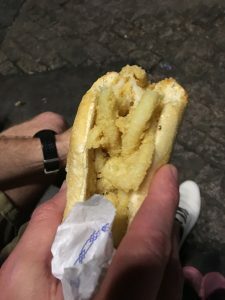 The bocadillo de calamares (calamari sandwich) is a delicious sandwich that is a must-eat, specifically in Madrid, where it is most popular. These were great, cheap meals that you can pick at many places and eat in a park or while walking around. 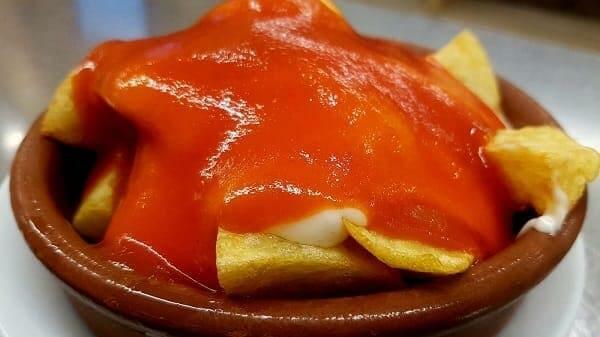 Another popular food in Spain is patatas bravas. They’re potatoes topped with a spicy tomato sauce and an aioli sauce. Although the sauce isn’t really all that spicy compared to levels of spiciness in other countries. After all, Spain is not known for spicy food. Patatas bravas are a great thing to get when sharing with friends as they can be a lot for one person to eat. They’re also pretty filling and make for a good food to eat for dinner before going out for the night, which in Spain can last until sunrise. Just as our parents taught us, we’re saving dessert for last on our must-eat food in Spain list with churros con chocolate. Similar to the chorizo, Spanish churros are different than the Mexican churros most people might be expecting. Spanish churros are fried dough, but are not covered in sugar and cinnamon like their Mexican counterparts. 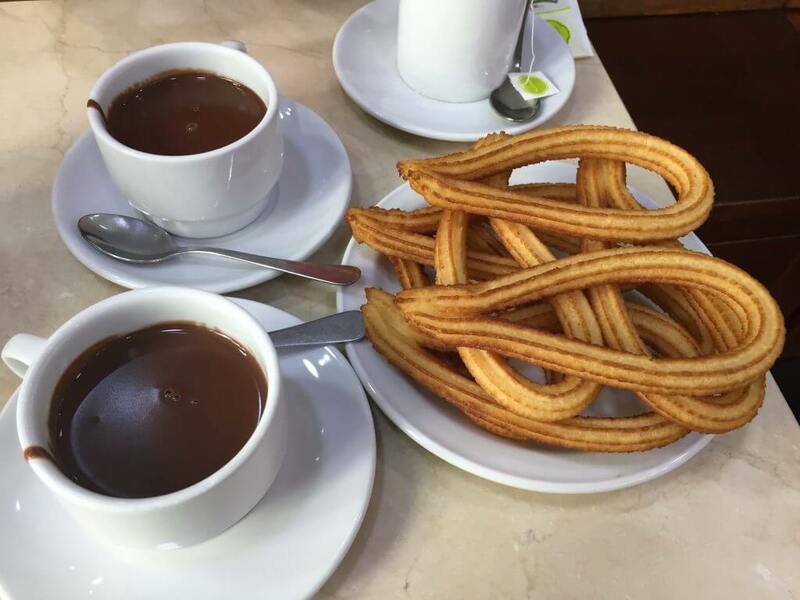 You can get churros con chocolate in almost any city in Spain. If you’re in Madrid though, head to Chocolatería San Gines or Los Artesanos 1902 for some of the best churros con chocolate in Spain. Here are some other recommendations on where to eat in Madrid. 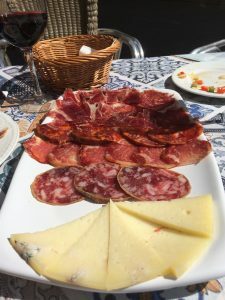 Spain is full of delicious food, and it was difficult to narrow them all down to a short list of must-eat foods in Spain. You could live in Spain for a year and not even eat all the yummy food it has to offer. 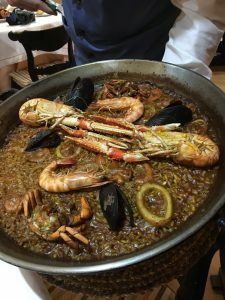 Some food is specific to certain regions of Spain, so we tried to make this list full of food that you can find anywhere in the country. What’s on your list of must-eat food in Spain? Is there anything we missed? Where would you recommend getting these must-eat foods in Spain?